Today it works and I got the message afterwards, too. I cannot start it again but... okay. I need some repeats to understand the Norwegians. Maybe it works tomorrow again. Heavy weather over Vestfjorden on her way to Bodø for our old lady. Yesterday she broke a window on the bridge out there on the fjord, but it was changed in Bodø and they went directly to Rørvik to pick up on the route. As the article in the newspaper Nordlys say, an external lamp broke loose in the heavy wind and sea, fell down and broke the window. I wish we could get an image of her completely covered in ice all over her black skirt... ehh... black hull... , that would be really cool. I find your photo at #361 in this topic to be even better than 100% ice. I just love those waves of frozen spray. It would be good to see some heavy ice for comparison but if not this Winter, we have to ask "when?" Anyway, I must sit down and watch some Winter Olympics now. Yesterday was a rare day for us Brits - a Winter Olympics Gold (despite a ridiculous protest from the Canadian team). I see Norway is doing well .... as usual. I It would be good to see some heavy ice for comparison but if not this Winter, we have to ask "when?" I'm afraid it''s not likely you'll see som heavy ice along the route of Hurtigruten no matter how cold it gets - this as a result of the gulf stream. I do remember a very old image of, ehhh... possibly old Lofoten, totally encapsulated in heavy ice after a rough winter ride at the FInnmark coast. But that was a long time ago: and it was a black and white photo. Yes, that Gulf Stream has a lot to answer for. It spoils all our fun. Just think how many more Winter Olympic medals we might win if the UK had Nordic Winters every year. But what about Trollfjord? Didn't she get caught in the Oslo Fjord ice before her spell in Fredericia? She must have collected some ice but less, I expect, than the Farallon. For people who don't already know, Farallon's is a great (true) story of human survival in remote Winter conditions. I think people must have been tougher back in 1910. English survival expert and broadcaster Ray Mears made a whole program about it. Trollfjord didn't get cought, but she had to cancel the calls besides from Oslo becauste of the ice situation. 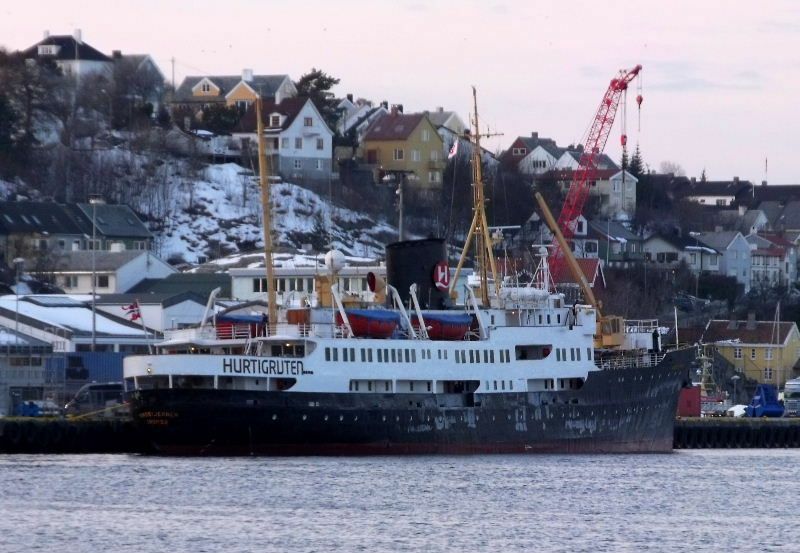 She's in Harstad now for repairs. Aaargh, I tried to board yesterday in Tromsø (she was docked inaccessible north of the bridge, so no pic), and they had already cancelled (never told me why). This morning I heard it on the local news. Last edited by HARALD JARL; March 8th, 2010, 17:56. Bengt: as usual, you provide great images which I'm a total fan of. She looks good in your images, despite the low light and rainy weather! When I see images like these, I feel sad we didn't have digital cameras around when the Italian coastal steamers sailed. I am absolutely agree with you. When I am thinking back how many times I travelled with the old ships and never took a photo, it's sad to think about. And just think about how many who actually had cameras, who's not on any forum today and never have published their pictures in any book. It must be hundreds if not thousands of images from the world of hurtigruten we have never seen...., or never get to see. Have you thought about that...? Last edited by Sterkoder; March 9th, 2010, 23:54. And just think about how many who actually had cameras, who's not on any forum today and never have published their pictures in any book. It must bu hundreds if not thousands of images from the world of hurtigruten we have never seen...., or never get to see. Have you thought about that...? That is the most stomach-wrenching feeling of them all.... I wish we had so much more photographic evidences of the Italians, the old Nordlys, Håkon Jarl,... all of them. Jeez-kraist, dear buddies - PLEASE take your Italian-ship discussion to the appropriate thread!!! According to HR-website as of yesterday (monday), NX was to sail to Harstad for repairs, instead of doing the Finnmark coast. Is she still in Breivika Tromsø? All times are GMT+1. This page was generated at 17:52.